If you like the idea of ride comfort mixed with frugal fuel economy and almost-sporty road behavior in a spacious compact, the Sentra can be a good common-sense choice. Shoppers who demand complete safety features should note that every Sentra contains both side-curtain and seat-mounted airbags, though anti-lock braking (ABS) is an option rather than standard, except on the top-rung 2.0 SL model. I haven't had any problems so far except for flat tires. I would say it performs well as it is my daily driver and I have made 2 out of town (1hr+) trips with it. I enjoy the fact that the seats are not leather, and the window controls fully work. I also like the fact that I can lock all the windows except mine, from my kids. I use all of the compartments, and the gas lever is the same as the trunk lever, except I push down to pop the gas lock. Driving wise, it's smooth. It does not handle potholes or train tracks very well when going faster then 15, but for the most part I try to avoid hitting potholes and I just go slower on tracks. Otherwise, on the highway and freeway it handles turns well at high speeds (60-75mph). It is a quick start like 0-30 in about 7 secs which is nice. It also is not very expensive to fill ($35) and that lasts me typically 2 weeks and like 2 or 3 days when I'm only doing in town runs.im not sure what else to say. . The lights are very bright but not blinding at night, the a.c. and heater work exceptionally well, only takes about 5 minutes to get warm or cool. Yupp, I'm very happy with my car. 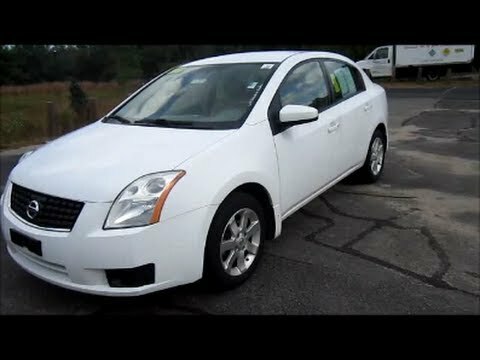 Nissan Sentra is a reliable compact car. The performance of this vehicle is great! I save so much more gas than I use to on my Honda Accord. It is super reliable, I drive long distances on a daily basis and have had this car for a year and it is done amazing so far. Since I have bought it I have only had to get an oil change and that is it but that is only for maintenance purposes. The only thing I would change about it, is the way it accelerates. My Honda never had any problems with that and with my Nissan it does not seem like it is meant to drive fast as I would like it to. It is also a comfortable compact car and I just love that I bought this vehicle to begin with. Perfect vehicle for day to day use and the occasional road trip. My Nissan Sentra has been a great vehicle for your day to day commute. It has been reliable, fuel efficient, and easy to drive. My only issue has been the transmission which turned out to be a cracked oil pan. I bought this vehicle used and has not had any maintenance issues besides the regular oil change. I put 44, 000 miles on it in two years and it is still running great!